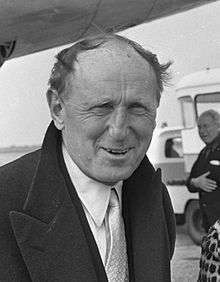 His father was killed in the First World War before Bourvil was born. As a result, he spent his entire childhood in the village of Bourville, the name of which inspired his stage name. He married Jeanne Lefrique on 23 January 1943. After a battle with Kahler's syndrome, which attacks the bone marrow, he died at the age of 53. He is buried in Montainville, Yvelines. In his comic performances Bourvil principally played roles of gentle and well-meaning characters who were often a bit obtuse or naive, such as his roles opposite the hyperactive, dishonest and bossy ones played by Louis de Funès. Bourvil's characters not only managed to make viewers laugh, but also to save themselves from the Machiavellian designs of adversaries. Bourvil was, however, also capable of more dramatic roles such as the handyman in L'Arbre de Noël (1969). In this role he observes the relationship between a man he works for and the young son who has fallen ill. The audience can identify with the character played by Bourvil, just as they can in his comic roles, so often as a simple man. One can also note his role of Thénardier in the film adaptation of Les Misérables (1958), and his last role as the policeman Mattei in Jean-Pierre Melville's Le Cercle rouge (1970). ↑ "4th Moscow International Film Festival (1965)". MIFF. Archived from the original on 16 January 2013. Retrieved 2012-12-06.